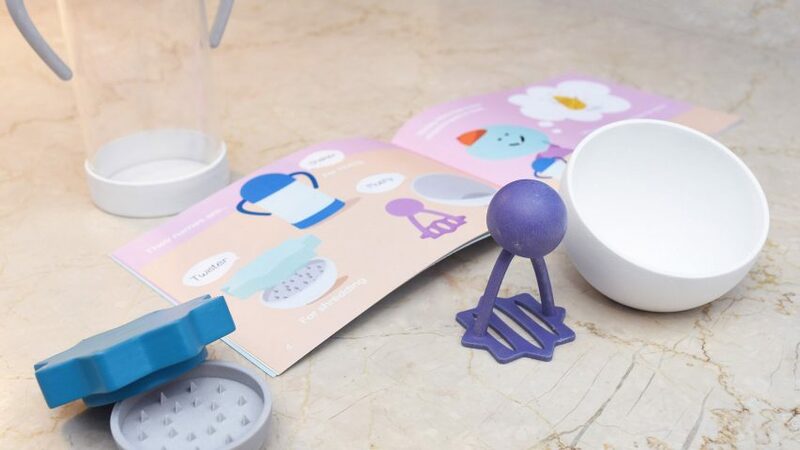 Royal College of Art graduate Florencia Sepúlveda has created a set of utensils and recipe books to help children experiment with food and flavours. They revolve around fictional food inventor Nico, who appears in a series of stories that guide children through preparing ingredients and making meals. "I was interested in exploring how we might develop healthier eating habits by creating a deeper connection with the food we eat," Sepúlveda told Dezeen. "I decided to focus on children because, as research suggests, our early experiences with food are the foundations for our preferences and behaviours throughout our lives." 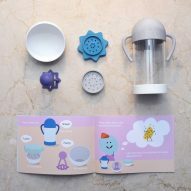 Kids are encouraged to read the books and make use of an accompanying collection of Nico Cooks tools – designed with striking shapes in pastel colours to be more accessible and appealing for younger users. Sepúlveda's research revealed that many children's fear of new foods discouraged them from trying unfamiliar ingredients. Rather than pressuring children into trying new flavours, the Nico Cooks utensils offer a more playful alternative, letting them be more hands-on and make their own food. "This encourages them to approach food with a playful, curious and inquisitive attitude, that they can bring to the dinner table," added the designer, who studied in the Royal College of Art's Global Innovation Design masters programme. "When you generate these types of environments, kids willingly start touching, smelling and tasting food." The tools include a flask-style shaker that lets ingredients be mixed freely, a masher for soft food, and a twister that lets kids shred leaves, herbs or garlic. 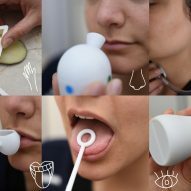 In addition to the cooking utensils, Sepúlveda also created the Nico Tastes toolkit – a separate lab-style set of devices that let children assess food using different senses. 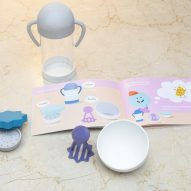 This includes a container with a funnel that can be used to hide and guess food by its scent, and a set of smaller tools with exaggerated forms that mean children can taste ingredients in tiny quantities. 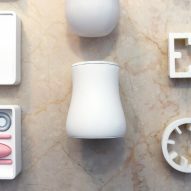 "The different shapes bring novelty to the experience, while making them think about the most appropriate tool for each thing they try," said the designer. 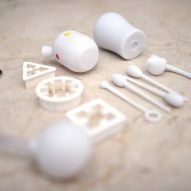 Other tools include a food kaleidoscope, a stethoscope for listening to the sounds of chewing and digestion, and a set of cutters that punch geometric shapes out of ingredients – which can then be joined together to create sculptures. "It's critical that these tools are fun, but that they are also functional in order to enable children to be proficient in the kitchen," added Sepúlveda. "I see this as a product that can be adapted to local contexts worldwide, developing tools, recipes and stories that are inspired by the different local cuisines and folklore around the globe." Sepúlveda is currently developing more recipes and stories featuring Nico, and exploring the ways the tools could be used by schools or nurseries. She isn't the only designer to experiment with the ways tools can change our perception of food. Others have created everything from strangely shaped tableware to tackle "mindless food consumption" to jelly-like plates that bounce and tremble in response to meals. Photography by Ryan Mario Yasin.